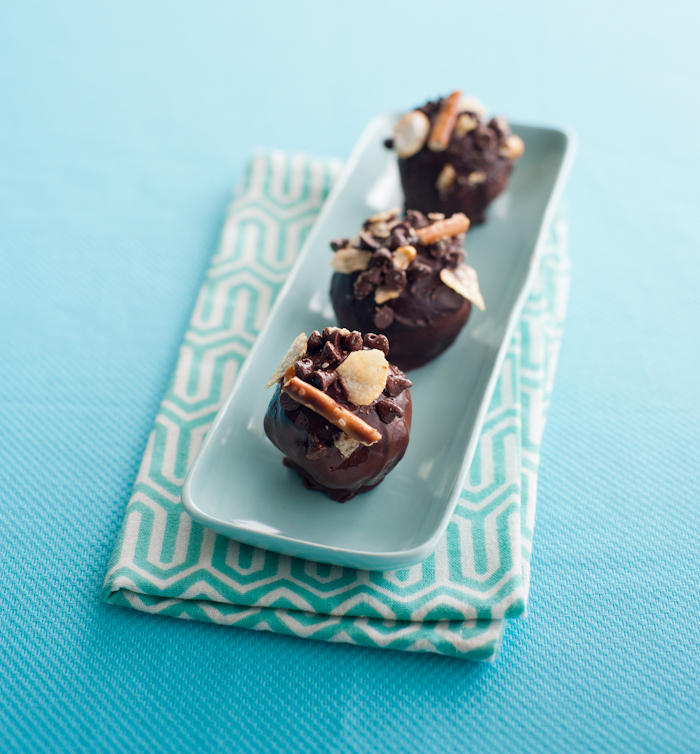 If you are a fan of salty-sweet combinations, this is the perfect cake ball for you. The inside is moist milk chocolate brownie and milk chocolate ganache. Dip in your choice of chocolate (I use semisweet in the recipe) and then coat with a mixture of pretzels, potato chips, mini chocolate morsels, and caramel corn. 1. Combine the brownie and 1/2 cup of the ganache. Test by compressing and tasting and add more ganache only if needed for flavor and moisture. Roll into golf ball–size cake balls. Refrigerate until firm. This can be done 1 day ahead; store in an airtight container once they are firm. 2. Line a rimmed baking sheet with parchment paper or aluminum foil. Toss the caramel corn, potato chips, pretzels, and mini morsels together in a bowl. Melt the chocolate in the microwave or a double boiler. Dip the balls one at a time in the chocolate, encouraging any excess chocolate to drip back into the container. Place, evenly spaced, on the prepared pans. Sprinkle a generous amount of the topping mixture on top of each cake ball while the chocolate is still wet. Use your fingers to scoop up additional topping and press to the sides of the balls. These balls look best when they are covered as completely as possible. Refrigerate briefly until the chocolate is set. Trim the bottoms, if needed. Place each cake ball in a paper cup, if desired. Place in a single layer in an airtight container and refrigerate for up to 4 days. Bring to room temperature before serving. Note: Since these cake balls are all about excess, why not divide the batch into thirds and dip some in dark, some in white, and some in milk chocolate?